Chamomile has an appealing flavor, a soothing scent, and plenty of medicinal benefits – from anti-inflammatory properties to its well-known use as a sleep aid. Though the first recorded reference of chamomile is from ancient Egypt, where it was dedicated to gods in an attempt to cure acute fevers, many researchers believe it was probably used by many cultures for thousands of years prior to this. In ancient Greece and Spain, chamomile was used to flavor light sherry, while Romans appreciated it for its smell and used it as incense. Promoting sleep. Chamomile works as a sedative by binding with compounds in the brain and inducing sleepiness. Relieving stomach complaints. Chamomile help reduce muscle spasms and therefore help resolve minor gastrointestinal problems. Reducing skin inflammation, including eczema. Chamomile contains active ingredients that block a compound in the body that causes inflammation. Healing wounds faster. Research has shown that using chamomile mouthwash may help more quickly cure mouth sores that are caused by cancer treatments. Besides its contemporary medicinal uses, chamomile has traditionally been used for other purposes, such as treating colic in infants. However, this type of treatment is not recommended without medical supervision, since some infants can be allergic to chamomile. Chamomile flowers contain an array of phytonutrients, including flavonoids, terpenes, and glucosides. Most notable are the terpenes alpha-bisabolol and chamazulene, as well as the flavonoid apigenin. Nutritionally, chamomile has vitamin A (retinol), calcium, magnesium, and potassium. Chamomile's anti-inflammatory activity is thanks, at least in part, to the aforementioned terpenes, which block prostaglandin E, a compound that induces inflammation. These compounds are not only antimicrobial, but have also been shown capable of penetrating the skin, making chamomile useful for topical application. On the other hand, chamomile's sedative nature is related to the flavonoid apigenin, which is thought to bind with benzodiazepine receptors in the brain, inducing sleepiness. Apigenin can also reduce levels of the adrenocorticotropic hormone (ACTH), which is related to the stress response. Additionally, apigenin has also shown antispasmodic activity and can help reduce gastrointestinal problems. Linden share the same soothing and muscle relaxant properties with chamomile, lavender also possess a sedative action, and thyme can be used as an alternative source for antispasmodic benefits as well. Chamomile is likely safe for most people when consumed orally. On rare occasions, chamomile tea and essential oils have triggered moderate to severe side effects, including anaphylactic shock, contact dermatitis, and severe allergic reactions. Individuals who are allergic to asters, chrysanthemums, ragweed, and other members of the Asteraceae family should not take chamomile because it can trigger an allergic reaction. Women who are pregnant or breastfeeding should consult a medical professional before taking chamomile, since it can cause uterine contractions. While it is occasionally used in culinary dishes, the most effective way of obtaining chamomile's numerous health benefits is in medicinal forms of consumption, where its properties are more concentrated. Infusions. One of its most popular medicinal forms, dried chamomile flowers can be brewed into a hot tea. Chamomile infusions primarily relieves upset stomach and bloating. Tinctures. In this concentrated form, chamomile relieves bloating and reduces muscle spasms in the stomach. Essential oil. The soothing fragrance of chamomile is often used as a relaxing agent in aromatherapy treatments. It calms the nerves and induces sleep. Capsules. Besides its antispasmodic and carminative effects, chamomile capsules act as a sedative and promote sleepiness. Dried chamomile is easy to find in most grocery stores and local markets around the world. The most common presentation of raw chamomile is in teabags that can be immediately added to hot water to make chamomile tea. However, fresh and dried chamomile petals are more likely to be found in specialized health stores. In addition, there is a wide variety of chamomile supplement choices available through online retailers. Each brand may come with different concentrations, so it is important to follow labels carefully. A perennial plant, English chamomile does best in temperate climates. Although it can tolerate droughts, it is still advisable to provide enough water to assure a high germination percentage. Follow the growing guidelines to help this herb thrive. While chamomile is tolerant to different soil types. However, it grows best on rich, heavy soils. Damp soils should be avoided. It can withstand cold weather with temperatures ranging 45 – 79°F (7 – 26°C). Chamomile's ideal pH is within the range of 6.6 – 7.3. Chamomile prefers direct sunlight, but it can also thrive in partial shade. Chamomile propagate by seeds, which should be sown during spring and autumn. The optimum temperature for good seed germination lies between 50 - 68°F (10 - 20°C). Chamomile is rarely attacked by pest or diseases; however, aphids can be a problem. More detailed information about growing chamomile can be found in our herb garden section. Coming from a creeping rootstock, chamomile grows up to 12 inches (30 cm) tall and has hairy stems and finely cut, threadlike, green leaves that have a scent similar to apple and pineapple. Daisy-like flowers grow half to one inch (1 - 2 cm) wide, with tiny white petals and a yellow center. Chamomile is a member of the Asteraceae family, which contains over 23,000 species spread out over 1,620 genera. The family can be found throughout the world and contains numerous different economically-important herbs, including sunflower, lettuce, and artichokes. Many of its species are popular in the herbal tea world. English or Roman chamomile (Chamaemelum nobilea) is often confused with German chamomile (Matricaria chamomilla), sometimes referred to by its synonym, M. recutita. Even though they are considered two different species, both have similar medicinal properties and are alike in many ways. Their main differences lie in their different growing habits and distributions. German chamomile can grow up to two feet (60 cm) tall and has hairless stems with threadlike, as well as more sparse and less ferny leaves than English chamomile. Along with German chamomile, English chamomile is often confused with field chamomile (Anthemis arvensis), Moroccan chamomile (Cladanthus mixtus), and wild chamomile (Matricaria discoidea). Steeped in history, chamomile was a medicinal favorite for the people of ancient Egypt, Greece, and Rome. In ancient Egypt, it was first mentioned as a cure for fevers and was rubbed into the skin for cosmetic purposes. 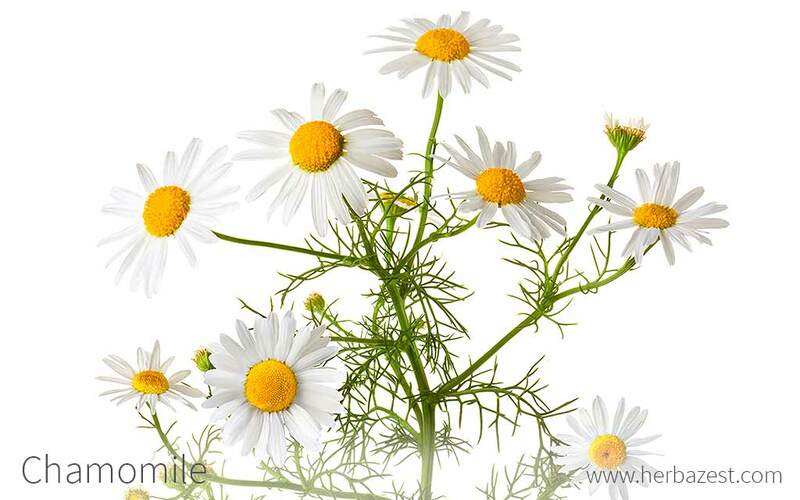 Chamomile was one of the main ingredients for embalming oil for preserving deceased pharaohs. In ancient Greece, the word chamomile comes from chamomaela, which means ground apple. In ancient Rome, chamomile was used for flavoring drinks and incense, as well as a medicinal herb. During the Middle Ages, chamomile was used instead of hops in the brewing of beer, and Vikings used it to shampoo their hair. Medieval Europe began using it for its medicinal purposes in herbal remedies. It was introduced to the Americas during the 1500s by European settlers, and by the 17th century, it was being extensively recommended as a cure for a wide range of ailments. The main producer of chamomile is Hungary, where this plant grows abundantly in poor soils and it is a source of income to poor inhabitants of these areas. Flowers are exported to Germany in bulk for distillation its essential oil. Chamomile is the fifth top-selling herb in the world, and between 1995 and 1998, the worldwide annual production of chamomile dried flowers doubled from 500 tons to 1,000 tons. According to pagan tradition, sprinkling chamomile over window sills and door frames was thought to keep negative energy and spirits away while filling the home with positive energy and light. Chamomile enjoys an important economic position in two different industries other than medicinal: culinary and cosmetic. In the culinary world, it is used to brew herbal teas, while in the cosmetic field chamomile is frequently added to hair and skin products. Chamomile can also be used at home as a shampoo to enhance the color of blonde hair. Additionally, cold chamomile teabags can be placed on the eyes to reduce puffiness, redness, and dark "bags."